Earl now builds several different models of Nyckelharpas. 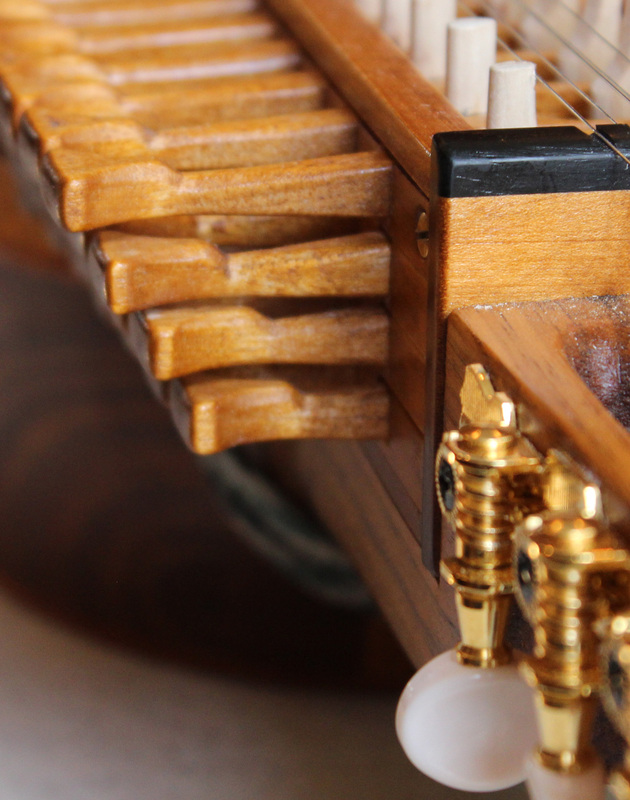 He has built 3-rowed chromatic nyckelharpas based on the Eric Sahlström model in both the full and 3/4 sizes. The body has solid wood sides that are tapered to make the back a little smaller for ease of holding. The nut-to-bridge (mensur) length is 400mm (340mm for the 3/4 size). His standard model has a 7-10-22 key set. He is not planning on building any more 3-rowed nyckelharpas. He will typically only have one if he gets it on a trade-up. He is now building 4-rowed soprano, alto and tenor nyckelharpas. He wants to have a cello nyckelharpa built by the spring of 2019. For the tenor, he is using the Johan Hedin plans developed in 2004. This harpa has tapered bent-wood sides similar to what is used on violins or guitars. The sympathetic resonation strings are below the keys. 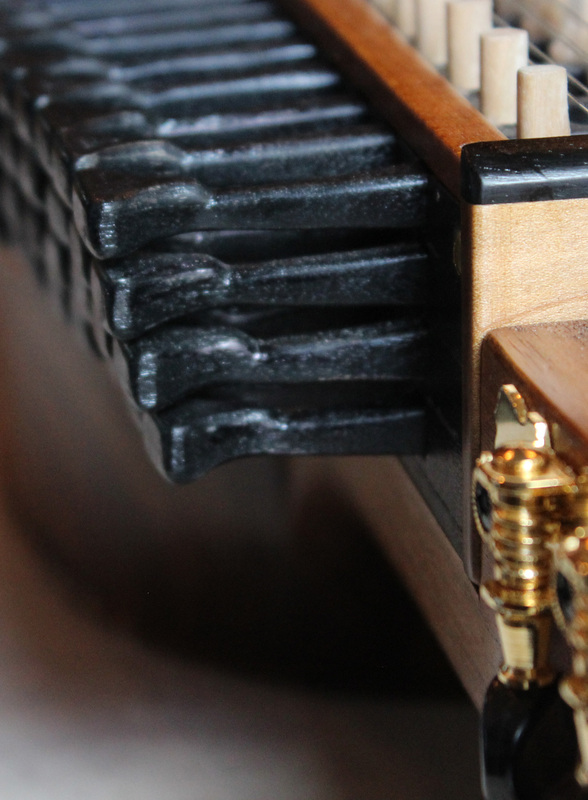 The neck and keybox are tapered to account for the amount that the strings vibrate. This instrument is tuned in fifths, one octave below a violin. There are two key set options available. The plans as designed have 70 keys including a number of ¼-tone notes. Responses he has received indicate that this key set is designed for advanced players who are doing early/baroque music that includes the ¼-tone notes. He has developed a second key set with 55 keys that does not include the ¼-tone notes. Pictures of both are in the photo gallery. About 1/4-tone keys and notes: They are a little hard to explain to someone not familiar with them. The use of 1/4-tone notes is a carryover form the long transition from the anhemitonic pentatonic into the current chromatic or diatonic scales system. There are some cultures that currently use 1/4-tone notes in their music, including some Swedish Kulning (shepherds songs). The early Enkelharpa and Esseharpa did have 1/4-tone notes. Boris Koller has written an article about it in German, available at http://www.cadence.articles.nyckelharpa.eu/anhemitonische-heptatonik_boris-koller.pdf. There is currently one alto-range instrument being re-worked. The standard model has a 7-10-10-22 key set. Earl will be working up a thin bent side body with the advanced key set for the alto, probably in the fall of 2018. After several iterations, Earl was able to get a good sounding 4-rowed soprano with a slightly smaller body. He has built intermediate (with shaped sides) and advanced (with bent sides) instruments, both with very good sound. He has three key sets available for these: 7-10-10-20 with 5mm setbacks between the rows of keys and a 10-12-14-22 with a 5mm setback as well as a more vertical setback that works well for people who have advanced violin/fiddle experience. The advanced key set allows for playing double stops up into 5th violin position with ease. The key tip rows with the more vertical position allows for hitting two adjacent row keys easily with a fingertip. This works well for some genres of music. 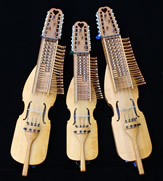 Earl will end up with several versions of violin-range nyckelharpas. This may get paired down at some future time depending on what players want. We have one 3-rowed Swedish range left-handed nyckelharpa available. The 4-rowed models need to be ordered. A guitar strap and a cello peg wrench are included with each instrument. A kit which includes a standard case (backpack straps, external pockets), beginner bow, Jule Bauer book, tuner and rosin add $500. Changes to the bow will adjust the price based on the bow prices. Sales tax and shipping are extra. Due to the use of a CNC router system, it is not easy for Earl to customize a key set for just one person. He also uses the CNC for the key guide strips. The use of the CNC gives good repeatable precision. We have heard from advanced players that Earl's keyboxes are some of the best being currently made. We have a 60-day return policy. If within 60 days, you decide to return the instrument, we will take it back. The customer will be responsible for the shipping costs, both ways plus $100/month (or portion of a month). If the instrument had any upgrades, the cost of the upgrade is not refundable. Humidity and harpa key box: One significant issue about nyckelharpas is that the key box and keys are made of wood and will be affected by changes in humidity. The gaps in the key box are made with minimal clearances. If the gaps get to big, it results in a buzzing sound that many players find problematic. What most builders do is make the keys work for the ambient air temperature and humidity that exists where they live. If the new home for the nyckelharpa has significantly higher humidity, it causes the keys and key guides to swell and some keys will stick. The fix is to partially dis-assemble the key box and a small portion of material is removed from either the key or the key guide to let the key move again. This needs to be done in the high humidity setting where the nyckelharpa now resides either by the owner or a friend/instrument technician who can do these adjustments. We live in northern Wisconsin. Sweden is actually a cooler/drier climate that Wisconsin in the summer. 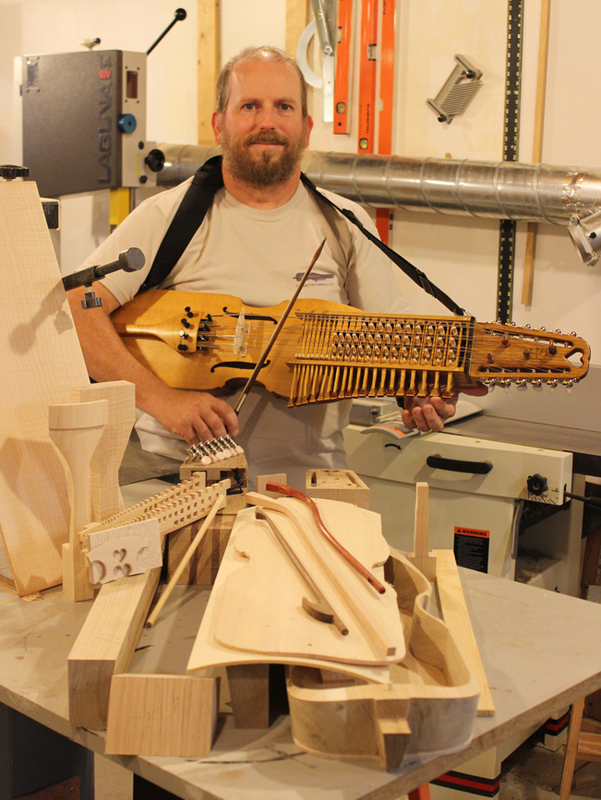 Earl recently had to re-adjust the keys on a new Swedish made nyckelharpa that now resides in Minnesota. This is a common new nyckelharpa owner issue in the first year. Much of the southeastern portion of the United States gets quite a bit warmer and more humid than we will ever see in northern Wisconsin. Earl is doing a key and key box treatment to try to partially stabilize the key box against changes in humidity. He thinks he is reducing the humidity affects by maybe 50 to 60%, but not eliminating the sticking problem totally. If you are having a sticky key problem and want to talk with someone about it, please feel free to give Earl a call. It does not have to be on a nyckelharpa that he built. We will soon be adding a nyckelharpa maintenance page to our web site that will include detailed instructions for fixing sticky keys. Earl provides free adjustments and minor repairs on any nyckelharpa built by him, limited to normal wear and tear on the instrument. This warrantee does not include negligent damage due to dropping, being sat on, aggressive playing techniques (wears out tangents prematurely and can break keys), etc. Additional warranties may be included on specific instruments on a case by case basis.